Is A Motorcycle The Ultimate Bug Out Vehicle? Whenever the topic of The End Of The World As We Know It (TEOTWAWKI) arises, some part of the discussion should be centered around the concept of a bug out vehicle. The reason is simple. If events deteriorate far enough, leaving might become a better option for survival than staying. At that point, there’s a good chance your Ford Focus, Smart Car, or Soccer Mom Van will be about as much use as knife at a gun fight. Depending upon the exact circumstances, appropriate bug out vehicles might be a 4WD pickup, 4WD SUV, or the topic of this article – a motorcycle. If your finances allow it, all three would be a great idea. While there are advantages and disadvantages to each, let’s consider the two-wheeler. Any motorcycle worth its salt should get at least 50 MPG, and maybe even more. This could suddenly become a very big deal if supply lines go down and gas either becomes astronomically priced or unavailable. If you need to get out of the city under those circumstances, nothing matters more than fuel economy. Speaking of fuel economy, you might be aware that most motorcycles’ come with fairly small fuel tanks. In a survival scenario, you want to be able to travel as far possible between fill up. Most cycle dealers carry some sort of larger aftermarket tank that should get you over 300 miles. The other primary benefit to keeping a motorcycle on hand as a bug out vehicle is the ability to maneuver around snarled traffic, trees in the road, or other hazards. You can even take the thing completely off road if necessary. This capability exists to some extent with larger four-wheel drive vehicles but nothing quite fits through narrow spaces like a motorcycle. Though the discussion thus far has centered upon singing the praises of a motorcycle as a bug out machine, it is by no means a perfect escape vehicle. There are two main disadvantages to be aware of: capacity and personal protection. If you have more than two people in your family, a motorcycle quickly becomes almost useless unless you plan to leave certain members of your family behind. We’re going to assume that option is out of the question. The bottom line is that three quickly becomes a crowd on a two-wheeler. To get an idea of what we’re talking about here, it helps to have seen the movie Zombieland, starring Woody Harrelson and Jesse Eisenberg, and featuring a hilarious cameo of Bill Murray playing himself. In that fictional post-apocalyptic America, Harrelson’s tough guy roams the desolate streets of America in a Cadillac Escalade outfitted with a snow plow and various types of exterior steel bar reinforcements that made it look like something out of The Road Warrior. Hollywood sensationalism? Of course, but the reasoning is sound. There’s a good chance your bug out vehicle will need to serve as a battering ram to slam your way through obstacles at some point. Motorcycles do not work well in this capacity. Keep in mind you can always toss your two-wheeler in the back of a 4WD pickup in order to extend your overall escape reach or to keep on high tailin’ if things get really dicey. Here’s another acronym known to survivalists. Get Out Of Dodge (GOOD). When it’s time to GOOD by motorcycle, you want to have put some thought into what you’re going to carry with you beforehand. After all, luggage space is at a severe premium when we’re talking about this type of vehicle. 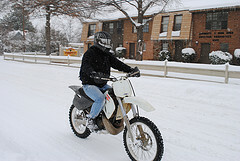 Consider military issue protective gear like helmet, gloves, pants, and boots. They all should be waterproof, which means ACTUALLY waterproof and not simply water resistant. There’s a difference. Make sure the boots are of the steel-toed marching variety, in case you have to ditch the bike and proceed on foot. Those snazzy biker boots are not good for long-distance walking. Your jacket and pants should have pockets. Lots and lots of pockets. Into these go such handy necessities as a folding knife, multi-use utility tool, survival grade butane lighter, matches, LED flashlight, toilet paper in a Zip Lock bag, cash, and important documents. You might even consider carrying a password protected jump drive with personal information like phone numbers, policy numbers, bank account information, photos, as well as copies of birth certificate, passport, and property titles. In the event satellites are still functioning, a handheld GPS unit is a great idea, but bring a road atlas as well in case the birds of technology are fried. A final thought. Make sure you actually know how to handle your bike in the event everything goes to hell in a hurry. This kind of bug out vehicle does you no good if you can’t stay in saddle or keep it upright.